Generation C (Gen1) standard flat long taper with 7 needle count. It's often used for thicker lining, fine shading, and filling. Original Generation C (Gen1) T-Tech needle cartridges have a patented design. Each cartridge has a standard twist lock mechanism, compatible with most conventional tattoo machine grips. It securely locks the cartridge in place for safe tattooing. The flats configurations are available with 5 and 7 needle points. 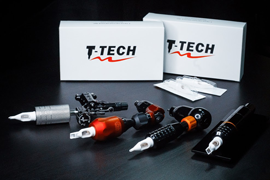 T-Tech flats allow for better ink dispersion and covering large areas while tattooing. It can be also used in lining and deep color packing, such as used in traditional styles. The flat needles are #12 (0.35mm) in diameter with a 3.5mm long taper. Each box contains 20 individually packaged needle cartridges of your chosen flat needles configuration. All cartridges are EO sterilized and individually packaged.